· Barometer allows for a much more precise automatic height control. · With 720p camera for photos and videos. | Real time image to Smartphone. · 3 flight speeds, suitable for any level. · Self-orientation, self-take-off and self-landing. · HD 720p camera with SD Card and FPV to Smartphone: This combination makes it different from the rest of most initiation drones with Live Video to Mobile. Usually these drones store photos and videos directly on the mobile device. During the broadcast of the video there is always loss of quality and there may even be interference when the drone is far away. And you record what you get. Here, in addition to this possibility, photos and videos are always stored on a memory card on board, always getting a quality recording without interference in addition to the ones you save on your phone. More precise automatic height control: The Drone combines the barometer with an optical sensor for this function, being the first starter drone on the market with such precise height control, especially when the drone does not fly high (up to 8 meters high). This feature allows the drone to be super easy to pilot by beginners. You can move it with just one hand! Navigation lights: With LEDs on the bottom of colors that allows you to distinguish the drone in the night flights. Battery indicator: At the top of the drone there are 4 battery status indicators. 3 speed modes: The X300 allows you to fly at 3 speed levels: 60, 80 and 100%. 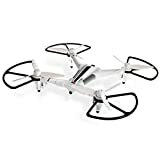 This makes it a perfect drone for any level of piloting. Mobile Control: You can fly it directly from your mobile phone or tablet, without using the radio. In addition, with Gravity mode you can move the drone by tilting your device, thanks to accelerometers. Auto-takeoff and auto-landing: Using a button on the transmitter, the drone can take off and land automatically. Requires: • AA batteries for RCTecnic.com Station, model shop and construction with confidence guarantee, real stock in Spain.